Sometimes I just have to give you a peek behind the curtain. 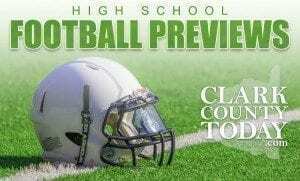 I sincerely hope you’ve been enjoying our preview coverage this week of the upcoming 2017 high school football season. On Tuesday, we published the first package of stories in a four-part series that will provide as much insight, depth and perspective as you will find anywhere on the 18 high school football programs in Clark County. First, we featured the Clark County teams in the Class 4A Greater St. Helens League and then followed that a day later (Wednesday) with the same coverage of the Class 3A GSHL teams. Today, the 2A GSHL teams get their turn and we will finish the series with a look at the Class 1A Trico League teams from our coverage area on Friday. Click to view all previews. It’s the largest project we have worked on collectively in the 11 months since we launched ClarkCountyToday.com in September of 2016. Keep in mind we have a relatively small staff at ClarkCountyToday.com, which currently consists of just six individuals. Four of us have been consumed with this project over the past couple of weeks. During my last two years as editor of The Reflector Newspaper, we produced similar coverage in the form of print product, a special tab section that was inserted into the newspaper. I worked side-by-side with graphic designer Andi Schwartz and photographer Mike Schultz to produce those tab sections and each year we were recognized with awards from the Washington Newspaper Publishers Association. It’s safe to say we took things to a new level at ClarkCountyToday.com. The biggest reason was veteran sports reporter Paul Valencia joined our team at the end of May. Soon after Paul’s arrival, we began to plan for this week’s football preview series. My only complaint of Paul’s participation in this project was that he tried to do all the work himself. Actually, that type of work ethic needs to be applauded. In addition to other duties, Paul literally worked around the clock for the past three weeks. He wrote all 18 preview stories of the teams in our coverage area in addition to primers of the four different leagues and other content required to pull the massive package of stories together. I don’t know how he did it. I’m sure his wife Jenny will be happy to have her husband back now that the series has been completed. Paul also shot half of the photos and video that we used in the series. The other half was shot by Schultz. In my humble opinion, Paul is the best sports reporter in Clark County and Mike is the best photographer/videographer and I would be happy to defend that claim to anyone who wants to dispute it. The use of video is the biggest difference in the content we are producing here at ClarkCountyToday.com and what we have done in the past in our experiences with print products. And, the person who has led us in this direction is Schwartz, an incredibly talented graphic designer. If you haven’t checked out the videos she produced for this series, please do so. It reminds me of videos I see on ESPN every day. No one put in more time on this project than Paul. A friend of mine always reminds me that “hard work, works.’’ I thought of that this week each night between 11 p.m. and 1 a.m. when Paul, Andi and I would each be working on our various tasks on the project while communicating and coordinating via email and text during those late hours. My excitement, however, isn’t contained to this single effort. With this talented team in place, I’m eager to head into the 2017 high school sports year. Football will be our primary focus during the fall because the sports’ participants, their parents and grandparents, and fans have an insatiable appetite for all the news they can find. But, we will also cover the other sports taking place this fall and on throughout the winter and spring sport seasons. We have a lot to be excited about at ClarkCountyToday.com. I hope you share that excitement and I encourage you to share this week’s football preview coverage with your friends and family.